Foxit Reader is the only eligible alternative reader/viewer for PDF files (eBooks). It's free, smaller, faster, and cleaner. And it starts up immediately, so you don't need to wait the annoying "Welcome" screen to disappear. Foxit PDF Reader is extremely easy to use, just double click it to start and then click open button to open your PDF document. If you want to print, click on "Print" button. If you want to setup the page layout for printing, select "Print Setup" from "File" menu. 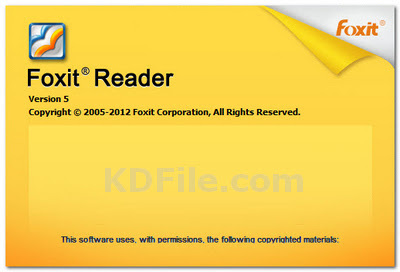 Foxit Reader supports Windows 98/ Me/ 2000/ XP/ 2003/ Vista/ 7. • Incredibly small: The download size of Foxit Reader is only 2.5 MB which is a fraction of Acrobat Reader 20 MB size. • Breezing-fast: When you run Foxit Reader, it launches instantly without any delay. You are not forced to view an annoying splash window displaying company logo, author names, etc. • Annotation tool: Have you ever wished to annotate (or comment on) a PDF document when you are reading it? Foxit Reader allows you to draw graphics, highlight text, type text and make notes on a PDF document and then print out or save the annotated document. • Text converter: You may convert the whole PDF document into a simple text file. • High security and privacy: Foxit Reader highly respects the security and privacy of users and will never connect to the Internet without users' permission. While other PDF readers often silently connect to the Internet in the background. Foxit PDF Reader does not contain any spyware.